Finding Friends (Zhao Pengyou) is a Chinese trick-taking card game for five or more players. It is one of several games in which a player’s score is represented by their card rank; this family of “level-raising” games is commonly called Shēng Jí (升级 ). Two decks of cards are used for the standard five player game, with an additional deck being added for more players. The level and trump suit change at the beginning of each hand, which is played between a “defending” team and an “attacking” team. These teams are also dynamic; finding your partners at the beginning of each hand gives the game its name. All players start on the 2’s level and are promoted to a higher level at the end of a hand if their team has won enough “points”. The game is over when a player passes the Ace level. Like many Western trick-taking games, only certain cards are worth points. They are the 5’s, 10’s and K’s. Each 5 is worth five points, and each 10 or K is worth ten points. Playing with two decks there are thus fifty points in each suit and two-hundred points total. It is only necessary to keep track of the attacking team’s points during the game, all other cards are placed in a trash pile after the trick has been won. For the very first hand of the game, a player cuts the deck and looks at the card, then counts off that many places around the table, moving counterclockwise[i]. The person they end on draws first, after the deck has been cut again to reestablish a random first card. Each player is trying to draw their level card, so at the start of the game everyone is looking for a 2. Cards are drawn counterclockwise one at a time until someone has drawn their level card and decided to show it, by laying it face up on the table[ii]. This action establishes the level and suit of trump for the hand, although both are subject to change until the deal is finished and play begins. The person who showed their level card is now the dealer. They deal all cards except the last eight to the players. [iii] During the deal, players receiving their cards can attempt to change the level and trump by playing a pair of their level cards. This action may only be attempted once per hand and is first come, first served, which provides an incentive to look at one’s cards as they are being dealt. If the player who originally set the level/trump has another of that level card (forming a pair) and chooses to show it, they take precedence and the level/trump stays the same[iv]; if they do not, the level and trump are changed. After the level and trump have been changed once they may not be changed again. When all the cards have been dealt and any level/trump challenges have been made, the game proceeds. At this point all five players should have an equal number of cards (twenty), with the eight undealt cards leftover. These eight cards are given to the leader, who puts them in his hand and then replaces them with eight of his cards face down[vi]. This pile is often called the “kitty” in other card games but is usually just “the bottom eight” in Finding Friends. It is won by the team which takes the last trick. Any point cards captured this way are counted double at the end, so if the attacking team takes the final trick and the bottom eight contains a K and a 5, they are worth thirty points. The leader, and only the leader, may look at what was placed in the bottom eight during the hand, and adjust strategy accordingly. The leader chooses a teammate by announcing a certain card; the player who throws this card is their partner. Any non-trump card can be called, but it is usually an Ace. If the leader already has one of that card then they say they would like “the other”. If they do not have the named card, they say they would like “the first”. It is worth noting that calling “the other” results in that player immediately knowing that they are the partner, while calling “the first” means they will need to play it quickly to establish that they are the partner [vii]. The leader and their new-found partner make up the “defending” team. The other three players form the “attacking” team. The leader starts the first trick, and play proceeds around the table counter-clockwise, with each player throwing the same number of cards, following suit and pattern as much as possible. The winner is the player of the highest card(s) in the suit which was led, or trump if it was played. If multiple people play cards of the same strength during a trick, the first person to play it wins the trick. The winner of each trick leads the next one. One or more cards[viii] may be led to start a trick, the possibilities are given below. 1. Any single card may be led. Everyone must play a single card in that suit if they have one. If they do not, they may play any card. Similar to other trick-taking games, the highest card in the starting suit wins unless it was trumped, in which case the highest trump takes the trick. 2. A pair of cards may be led. If a player has a pair in that suit they must play it. If they do not have a pair, they must play any two cards in that suit. If they do not have any two cards in that suit, they must play any cards in that suit which they have, after which they may play any cards. The trick is won by the highest pair[ix], with trump taking precedence. 3. Two pairs in a row (e.g. ♥Q♥Q-♥J♥J) may be led. [x] This is called a tractor and can only be beaten by another higher tractor[xi]. Similar to the rule for responding to a pair, players must play any pairs in the suit if they have them. If they do not, they must play any four cards in the suit unless they run out, after which they may play any cards. The highest tractor wins; trump takes precedence. 4. Any combination of the three options listed above may be played together so long as each individual element of the set cannot be beaten in its suit. a. For example, ♠A-♠K♠K may be played together since the ♠A is the highest card in a suit, and a pair of ♠K cannot be beaten if it is known that the ♠A pair does not exist. Players must respond with cards in the same way they would to each element, so if the set includes a pair, they must play a pair if they have one, and then continue with other cards in the suit as usual. To beat a set with trump, the entire response set must be trump, and all elements of the set must be matched. A non-trump ♠A-♠K♠K can therefore be beaten by a trump ♦Q-♦9♦9, but a ♠Q-♦9♦9 would not win since they had to play a spade before throwing their trump pair. b. In a more complicated situation, if an ♣A and a ♣Q have already been played in a suit, it would be safe to play ♣A-♣K♣K-♣Q-♣J together, since any card that would beat an element have already been accounted for, all the way down to the ♣J. c. If you are in doubt about whether a combination can be played, you may lay it on the table under the assumption that it is legal; if it is not, a player who can beat an element of the set must announce this, and all cards except the losing element are picked up. Thus, if a player tries to lead ♥A-♥K♥K-♥Q-♥J and someone announces that they can beat the ♥J with a ♥Q, all cards are picked up except the ♥J, which is played alone. The player who announces that they can beat an element does not have to beat it once it is their turn. · More than 5 players: the number of players required to add a third deck varies based on player preferences. Two decks may be used with as many as 7 players, but each player will receive very few cards and the jokers will need to be removed to ensure that the total number of cards (not counting the bottom) is divisible by the number of players. Adding a third deck will give each player more cards, but also introduces further complications with the relative strengths of single cards, pairs, and now three-of-a-kind’s. With 7 players there are also multiple players who are called by the leader to join the defending team. This is done by announcing more than one partner card. · 4 players: This is usually played with fixed partners, in a game called Tractor. If fluid partnerships are used like in Finding Friends, adjustments are sometimes made to the number of points required for each promotion level. Since there are fewer players on the attacking team, the cutoff points are often reduced by 20 points each. · Joker level: A pair of Jokers may be turned over to switch to this level, in which the Jokers are the only trump. Some people play that the Joker level is above Ace and can only be activated by players on that level, while others play that it can be activated at any time. 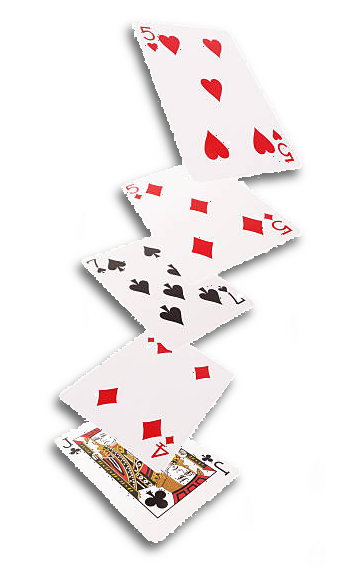 · The point multiplier used for the cards captured in the bottom eight may be determined by the trick used to capture it. If a solo card is used, the multiplier is x2 as usual. If two cards (either together or a pair) are used for the capture, the multiplier is x3, and if three cards are used, it is x4. [i] The step of drawing a random card to find the first player will be unnecessary in subsequent hands as the first person to draw is simply the player to the right of the last person to do so. [ii] It is possible, though rare, for players to draw all available cards (both decks minus the last eight) without anyone receiving and playing their level card, if this occurs simply reshuffle the cards and repeat with the same initial person drawing first. [iii] If anyone fails to receive a point card, the hand must be redealt. This is extremely rare. [iv] Their “rebuttal” may not be a different suit than their original level/trump card. [v] These are all an equivalent “rank”, but only two identical cards from the six may be played as a pair. [vi] Cards picked up from the bottom eight need not be kept and may be returned to it. [vii] If “the first” card is called and that player happens to have both in a pair, they are locked as partners in the same way as calling “the other”. [viii] They must all be in the same suit. [ix] Two solo trump cards do not beat a pair. [x] If the trump and level is a ♠4, then ♥5♥5-♥3♥3 would form a tractor since all the 4’s have been moved to trump and the 5’s and 3’s are now adjacent. ♣4♣4-♦4♦4 would not be a tractor, since the off-suit level cards are the same strength. [xi] Higher pairs which are not consecutive, and therefore not a tractor, do not beat a tractor. Website by R. Lucas Thomas III, last updated September 2018.